Posted: Sat May 05, 2012 7:43 pm Post subject: ows? ahahahaah just want to have songs. what site is this again??? magicJack and magicJack Plus are trademarks of magicJack LLP. 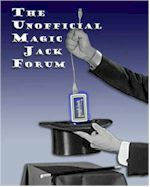 This website is in no way affiliated, endorsed, or sponsored by magicJack LLP, and is an unofficial forum for consumers to openly communicate regarding their experiences with the magicJack products.